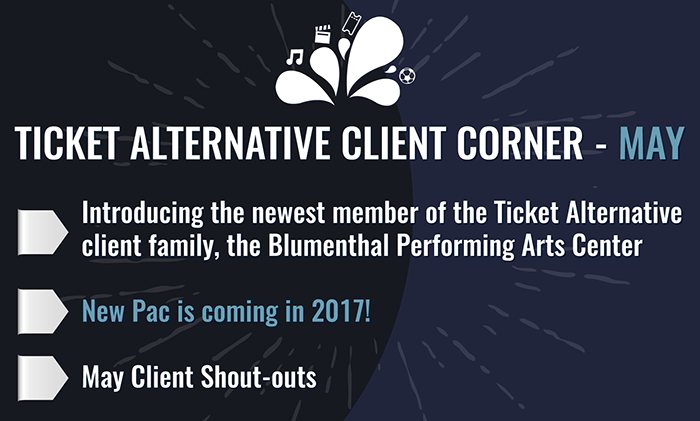 Ticket Alternative is excited to announce a new partnership with the Blumenthal Performing Arts Center out of Charlotte, North Carolina. The partnership formed as a result of Blumenthal’s desire to improve the level of customer service offered in their call center. Welcoming nearly 630,000 attendees annually, a call center with dedicated, expert knowledge of ticketing and events is a must-have! The Blumenthal is a perfect addition to our call center client roster which already includes The (Fabulous) Fox Theatre and Atlanta Botanical Gardens. Our partnership officially kicks off on June 1! New Pac is coming in 2017! A major upgrade to our platform is coming later this year. Our ticketing system provider Spectra (formerly Paciolan), is making a number of exciting changes to the Paciolan platform. Codenamed “PAC8”, it will incorporate a number of CRM-like features that are perfect for clients who want a CRM tool without requiring the robust nature of a full CRM system. Touchpoint –Touchpoints can be assigned to operators for follow up on single accounts or batches of patrons. Notes – Notes allows users to leave key information on a contact, deal, Touchpoint, etc. Detailed account history, including orders, Touchpoints, email contact history, and more. We’ll continue to update you on new features and the expected launch date. Bert’s Warehouse’s second event with Ticket Alternative, The Purple Party; The Ultimate Prince Celebration and Tribute is just a couple of weeks away in Detroit! The Fred in Peachtree City, GA, kicked off their Summer Concert Series with Smash Mouth this month! Their Spotlight Series continues this weekend with Rebel Rebel – David Bowie Tribute! Sweetland Amphitheatre hosts their third show of their summer series on June 9th with Vince Gill! Vinyl and Loft (at Center Stage) hosted amazing late night shows during Shaky Knees weekend this month! Mill Town Music Hall announced an all-star addition to their line-up this month when Billy Ray Cyrus went on sale! We kicked off marketing efforts with our new(er) client the TrackTown Summer Series Championship, held this summer in New York!